Net Wt. 20lbs (9.09kg). Made in Poland. IMPORTANT: DO NOT use lighter fluid when starting your charcoal in a Kamado Ceramic grill. If you intend to use this charcoal with other types of grills, please follow the manufacturer’s directions for use of their product. Directions: For starting, use an electric starter charcoal lighter, a chimney style charcoal starter using paper as fuel, or firelighters. You are ready to grill when the coals are white around the edges. Check your temperature and start grilling! Our custom blended Oak, Birch and Beech Lump Charcoal will make your Steaks, Chicken, Pizza, Seafood and everything you grill more delicious. This blended charcoal provides a sweet, authentic smoky flavour that barbecue lovers desire. You will find the charcoal is fast lighting, has consistent heat and provides longer burn times, while producing less ash. 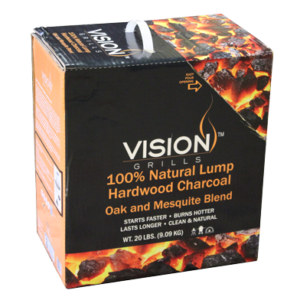 Ideal for grills and smokers, it brings real hardwood flavour to whatever you cook or grill. KEEPING IT GREEN: Our charcoal is FSC compliant. This means that for every tree that is cut down for our product, a tree is planted in its place. No chemicals or fillers are added. We use all natural highly carbonized charcoal. Almost the entire log is used in our process of manufacturing lump charcoal. We are proud to be good stewards of the land.